Not long after she was first diagnosed, I knew I wanted to do something special to encourage and inspire her. I decided I was going to paint a picture for her that would symbolize the battle ahead of her and what I hoped the ultimate outcome would be. I thought about it for quite a while, waiting for inspiration to strike, and eventually it did. 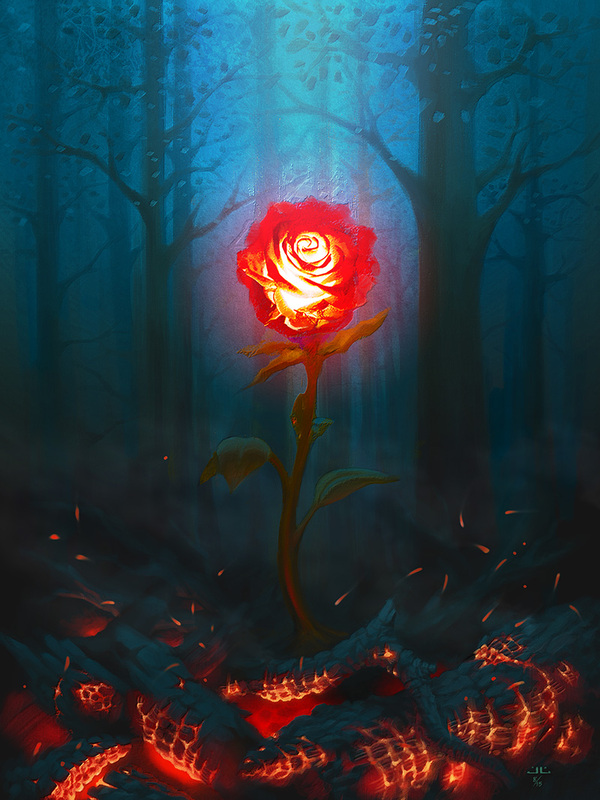 I had a very clear mental image of single, luminous rose in a field of ash and embers, having not only survived the fire but actually burning with its own inner light. I’ve been down this creative path before and I’ve learned not to ignore that kind of inspiration. There are times when an image is simply the right one and it practically paints itself. As I set to work on what I simply called “Lisa’s Painting,” I felt certain my vision for it would be realized… but that certainty began to fade all too quickly. Sometimes when an image paints itself, it doesn’t always do so in the way the artist intended. The further I went, the more this one took on a life of its own and seemed determined to go in a direction I didn’t want. I wanted it to be inspiring and uplifting but, as one of the few people I showed it to early on commented, it seemed more “beautiful but haunting.” I had wanted this to be a picture Lisa could hang on her wall and look at every day to raise her spirits, but it simply wasn’t turning out that way. I tried composition and color changes, flailing about for that original image in my mind that had felt so right, but it just wouldn’t come. Eventually, I decided I had to abandon it and start over with something completely different, but inspiration was no longer cooperating. I made several false starts on concepts that were just too trite or unoriginal and refused to come together beyond the rough sketch stage. Weeks turned into months and Lisa battled on. Despite some rough patches, her treatment seemed to be going well and I foolishly allowed myself to think I had the luxury of time. Just over a week ago, I learned abruptly that time was short and all I could do was travel with my parents to visit her in her final few days. She never really regained consciousness and I never got to tell her what she meant to me or how proud I was of her. I trust that she now knows those things and I am comforted by that, but I will always regret that I never finished what I started. Still, as I’ve thought about it over the intervening days, I’ve begun to wonder about that first painting and whether it might have been the right one after all, just not for her. I had long since titled it “Through the Fire,” and I realized its symbolism could also apply to those she left behind, as well as the mark she left upon this world and the light that still burns through her family and everyone else who loved her. I look at it now and the word “haunting” still lingers, but it also feels uplifting in a way it didn’t a week ago. I don’t know if others will see it the same way but I hope so. Even if no one ever hangs it on their wall, it was made for a reason, if only as a reminder that time is precious and should never be taken for granted. Farewell, Lisa, until we meet again. Nathan Kaiser "Kaiser on TrekBBS"
Condolences on your loss. I had a similar experience when my mom battled cancer herself and ultimately lost. In fact, today would’ve been her 66th birthday.